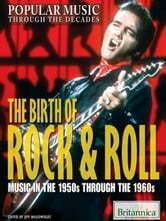 When rock and roll first burst onto the scene in the 1950s, it was more than a new form of music—it was a rebellion against the past. With the music of such artists as Elvis Presley, Buddy Holly, Little Richard, and the Supremes came a new attitude that allowed fans—many of them young—to look past the social norms of the time, a shift that included a greater interaction with and understanding between the races. This stunning, story-filled volume examines the phenomenon of rock and roll—the way it was before it crept into the mainstream it had once retaliated against—and the many musicians who made it into an art.